Travel in the highlands of Inca country, and you're likely to be offered cuy, a traditional Andean entree, on the menu. Cuy, alternately called Cobayo or conejillo de indias is a guinea pig or cavy. The taste is compared to rabbit. Though difficult to accept for people in other countries who regard guinea pigs as pets, the cuy is a staple of Andean cuisine. They are called "cuy" for the sound they make cuy, cuy. The cuy has a place in pre-Colombian Inca tradition. Consumed only by the nobility or used as a sacrifice and a means of foretelling the future via the entrails, there is a long history of the guinea pig (Cavia porcellus) in South America. Cuys are today raised commercially and form a nutritious part of the Andean diet. 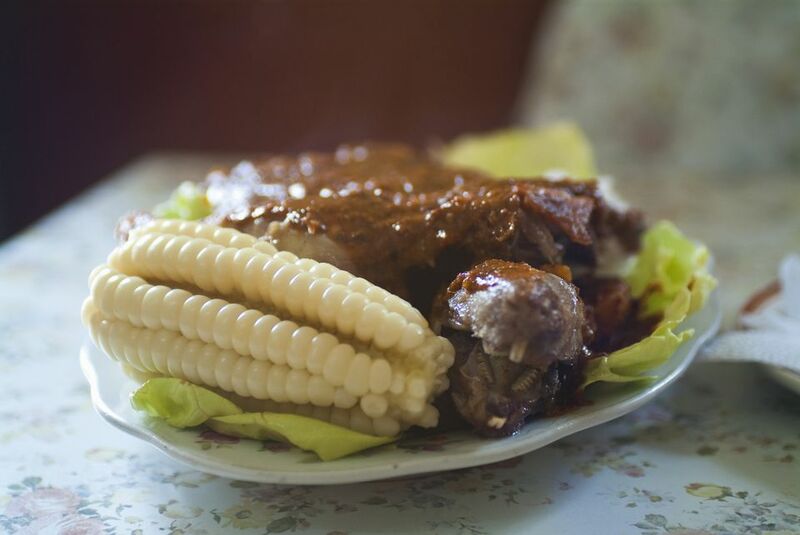 An important part of the ​Novoandina cuisine, cuys are prepared in various ways according to region, but in Peru, they are usually served with potatoes or rice and a savory, spicy sauce. In the Huancayo region, the cuy is preferred fried with a sauce of pepper and achiote. In Arequipa, it is prepared baked as cuy chaktado and in Cuzco, it is baked whole, as a small suckling pig, with a hot pepper in its mouth. In Huanuco, Tacna, and Cajamarca, the preference is also for fried cuy. Cuy is also popular in Bolivia, Argentina, and other South American countries where regional cuisine flavors the preparation. Cuys are available in the markets, already skinned and cleaned, but many recipes begin with instructions to skin the cuy in hot water, then remove the internal organs and cleanse well in salted water. Following this, hang the cuy to drain and dry. Since cuys are small, recipes call for one per person, unless the meat is cut into smaller portions. Most often, the cuy is split apart and cooked whole, with the head still attached. salt, pepper, and cumin to taste. Rub the cuys with a mix of the pepper, salt, pepper and cumin and bake. You can also skewer over a barbecue. Prepare a sauce with the oil, peppers, garlic, and cornmeal with the water from the potatoes or broth. Cook a few minutes until the peppers are cooked. When tender, place the meat in a serving dish and spoon the sauce over it. Serve with the boiled potatoes. salt, pepper to taste Season the cleaned cuys with salt, pepper, hot pepper and pisco. Fry in oil five minutes or until cooked. Serve with a hot pepper sauce, potatoes, either fried or boiled and a salad of cucumber, tomato, lettuce, and onion. Chicha is often served with cuy, as it was in Incan times. Buen provecho!